Rockalily Lipstick promotes and believes in celebrating women's femininity and prettiness, in all of its varied forms. This may include sizes, tattoos, hair colour, skin colour or fashion style. The media seems to reflect one particular beauty aesthetic, and it can enduce a constant feeling of never being good enough. Well, we are good enough....and I wear lipstick every day to prove it! 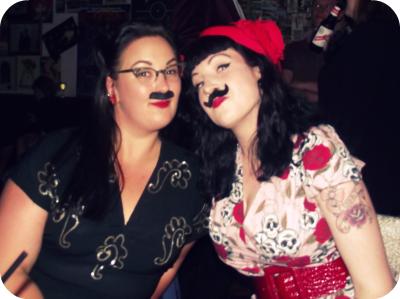 Rock 'n' Rolio is a regular little night at the Moustache Bar in Dalston, London (the next Rock 'n' Rolio night is June 4th) and as ever the night is free! Its a relaxed but swinging night full of the best vintage tunes. You don't need to dress in a certain style, or be able to dance a certain way, and as an added bonus the Moustache bar usually have free 'tashes to play with. Anyhoo...DJ Lovely Zoo (from Rock 'n' Rolio) has created this awesome playlist which fits the Rockalily philosophy perfectly! Its retro-tastic, celebrates women's shapes and had both me and Mother Rockette tapping our toes when we listened to it earlier this week. The Swallows tell us further into the mix that ''It ain't the meat, its the motion'' Apparently its the motion that makes your Daddy want to rock! I hate to state the obvious, of course Rockalily wants to celebrate all healthy body images - large and small, but there is something refreshing hearing music that doesn't necessarily fit to the current beauty stereotype. It gives me hope that we may one day be more open to variation than we are the moment!